The [ ] button launches the Smartphone Integration Mode. For additional information, refer to “NissanConnectSM with Mobile Apps” in this section. *No satellite radio reception is available when the SXM button is pressed to access satellite radio stations unless optional satellite receiver and antenna are installed and an SiriusXM® Satellite Radio service subscription is active. Satellite radio is not available in Alaska, Hawaii and Guam. For additional information, refer to “Audio operation precautions” regarding all operation precautions in this section. Place the ignition switch in the ACC or ON position and press the ON-OFF button while the system is off to call up the mode (radio, CD, AUX, Bluetooth® audio, USB or iPod®) that was playing immediately before the system was turned off. To turn the system off, press the ON-OFF button. AUX Volume Level/AUX Lev Controls the volume level of incoming sound when an auxiliary device is connected to the system. Available options are Low (Quiet), Medium, and High (Loud). The signal strength, activation status and other information are displayed on the screen. When the SXM button is pressed while the ignition switch is in the ACC or ON position, the radio will come on at the last station played. The last station played will also come on when the POWER button is pressed. *When the SXM button is pressed, the satellite radio mode will be skipped unless an optional satellite receiver and antenna are installed and a SiriusXM® Satellite Radio service subscription is active. Satellite radio is not available in Alaska, Hawaii and Guam. If a compact disc is playing when the SXM button is pressed, the compact disc will automatically be turned off and the last radio station played will come on. 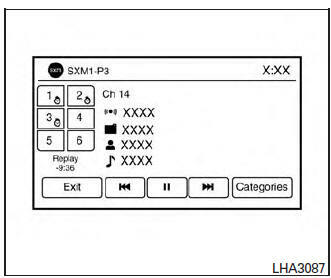 While the radio is in SXM mode, the operation can be controlled through the touch-screen. Touch the “Channels” key to display a list of channels. Touch a channel displayed on the list to change to that channel. Touch the “Categories” key to display a list of categories. Touch a category displayed on the list to display options within that category. 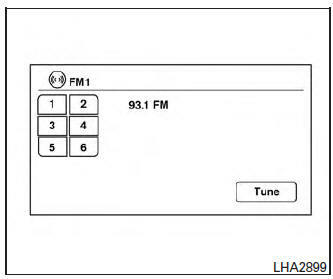 When in AM or FM mode, the radio can be tuned using the touch-screen. To bring up the visual tuner, touch the “Tune” key on the lower right corner of the screen. A screen appears with a bar running from low frequencies on the left to high frequencies on the right. Touch the screen at the location of the frequency you wish to tune and the station will change to that frequency. To return to the regular radio display screen, touch the “OK” key. 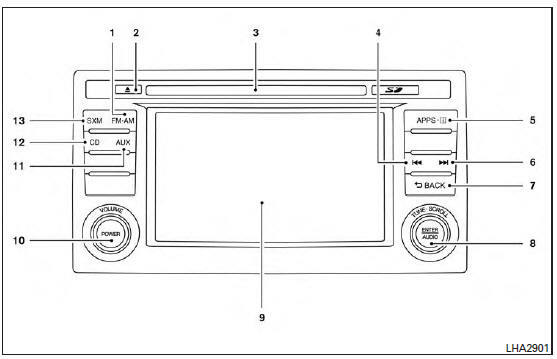 The radio can also be manually tuned using the TUNE/SCROLL knob. When in FM or AM mode, turn the TUNE/SCROLL knob to the left for lower frequencies or to the right for higher frequencies. When in SXM mode, turn the TUNE/SCROLL knob to change the channel. When in FM or AM mode, press the or seek buttons to tune from low to high or high to low frequencies and to stop at the next broadcasting station. When in SXM mode, press the or seek buttons to change the category. Twelve stations can be set for the FM band (six for FM1, six for FM2) and six stations can be set for the AM band. 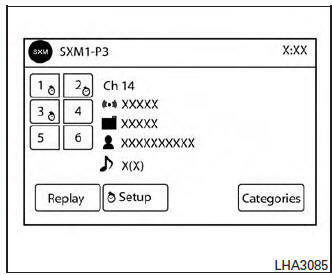 Eighteen stations can be set for the SXM band (six for SXM1, six for SXM2, six for SXM3). Choose the radio band AM, FM1 or FM2 using the FM·AM select button or choose the radio band SXM1, SXM2, SXM3 using the SXM button. Tune to the desired station using manual or seek tuning. Touch and hold any of the desired station memory keys (1 – 6) until a beep sound is heard. Other keys can be set in the same manner. Presets can also be selected by touching the desired preset number on the screen. The Smart Favorites feature allows the user to designate presets, within the SXM1, SXM2 and SXM3 bands, as their Smart Favorites. When any of the Smart Favorite presets are selected, the current track on that station will play from the beginning of the song. Touch the “Tune Start” key to activate (ON) or deactivate (OFF) Smart Favorites. Touch the “Add Preset” key to select an available preset. For additional information, refer to “1 to 6 station memory operations” in this section regarding preset memory options. Smart Favorites will start functioning only after the audio unit is turned on for a few minutes. Tune Start is supported for music channels only. The Replay Screen gives the user the ability to replay, skip, pause or rewind the currently aired track. To skip a track, press the track button. “Live” will appear in the bottom left corner of the screen indicating the difference from play time to live audio. To pause a track, press the pause button. To rewind/ fast forward a track, hold the or seek/ track button. When the CD button is pressed with the system off and the compact disc loaded, the system will turn on and the compact disc will start to play. When the CD button is pressed with a compact disc loaded and the radio playing, the radio will automatically be turned off and the compact disc will start to play. Press and hold the or seek buttons for 1.5 seconds while the compact disc is playing to reverse or fast forward the track being played. The compact disc plays at an increased speed while reversing or fast forwarding. When the button is released, the compact disc returns to normal play speed. Press the seek button while a CD or MP3/WMA CD is playing to return to the beginning of the current track. Press the seek button several times to skip backward several tracks. Press the seek button while a CD or MP3/WMA CD is playing to advance one track. Press the seek button several times to skip forward several tracks. If the last track on a CD is skipped, the first track on the disc is played. If the last track in a folder of an MP3/WMA CD is skipped, the first track of the next folder is played. The AUX IN audio input jack accepts any standard analog audio input such as from a portable cassette tape/CD player, MP3 player or a laptop computer. Press the AUX button to play a compatible device plugged into the AUX IN jack. When the CD EJECT button is pressed with a compact disc loaded, the compact disc will eject and the last source will be played. If the disc is not removed within 10 seconds, the disc will reload. For additional information, refer to “iPod® player operation with Navigation System” regarding the iPod® player available with this system in this section. For additional information, refer to “USB (Universal Serial Bus) Connection Port (models with Navigation System)” regarding the USB (Universal Serial Bus) Connection Port available with this system in this section. For additional information, refer to “Bluetooth® streaming audio with Navigation System” regarding the Bluetooth® audio interface available with this system in this section.